A major target for boycott is currently the Sodastream company – chosen by the PSC and by the BDS movement for many reasons you can explore at more length here, but in brief this major company, which has an international presence, has its main manufacturing plant in an illegal colony on stolen Palestinian land. This ‘settlement’ is one of the largest in the West Bank, built on the remains of seven Palestinian villages. It is often defended on the basis that it provides work for Palestinians, but those very workers have testified about the appalling conditions they work in and the lack of basic workplace rights they enjoy. Palestine Solidarity Campaign is asking supporters of Palestinian rights to target stores and chains which stock the SodaStream Drinksmaker, and ask them to take the product off their shelves. This will hit SodaStream where it hurts – in the pocket. Stores which trade with SodaStream and give the company outlets to sell its products are playing their own part in aiding the financial stability of the settlements and helping the occupation to continue. Below are the names of companies which stock SodaStream products. Please write to the head office of each company and ask it to remove SodaStream from its shelves, outlining the reasons why. 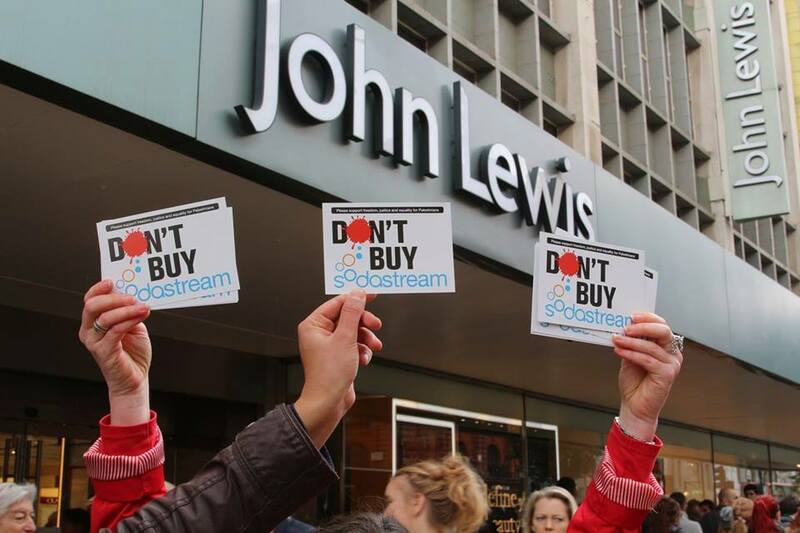 Get involved – let more companies know they shouldn’t be doing business with occupation profiteer, SodaStream.